Gratitude makes all things new! When I am aware of my Source in Love, I see its activity everywhere. It is the Substance of Life itself! I am in the flow and create and expand with Love, in Life! How often have I asked, “How do I know?” How often has the skeptic voiced its concerns about this consciousness process? Today, and perhaps only for today, I feel like I have answers. First, one way I can know I am in the flow, or on the right path, is I feel relaxed and at peace. My mind is not struggling, my thoughts are not overwhelming me; the circumstances of tension and antagonism driving me forward are still present, but I am calm within them. Kant formulated what he called the moral imperatives. An imperative is: something one must do (the means) in order to achieve a certain end. A moral imperative is what one must do to achieve moral ends. 1) Ask yourself, “Can my actions be universalized without contradiction?” Or, if I take a certain action, what would the world be like if everyone acted that way? 3) Every person is both means and end (see #2). When everyone acts in consideration of everyone else’s means and ends (universalized action, see #1), we are acting in accordance with the Kingdom of Ends, which is the harmonious action that respects and dignifies all of humanity. For me, the very first maxim is shaky. How do I know (there it is again) if my action can be universalized? And how can I even imagine what the world might be like if everyone behaved as I do? Maybe some people don’t like the way I behave…. There’s way too much wiggle room for justifying personal (selfish) actions in the name of “The world would be a better place if everyone acted like this”, even if people did follow the second and third maxims. These maxims rely on people to be fully reasonable and rational. Kant was, but many people are not and even the ones who are can think and perceive irrationally, especially to justify their own ends. So, what can I do in the moment to make choices I believe to be the best for all (universalized)? Here’s what I’ve come up with. Unlike Kant, these are not maxims, dictates, or directives (which Kant does address in his writing on duty and free will); these are questions I can ask myself in any moment, any situation, to help me know if my actions or decisions are the best I can do right now, to serve a universal end (which for me is Love). 1) What do I serve? 3) Toward what end do I utilize what serves me? Think about this in your own terms. Come up with your own thoughts. Be critical for yourself of how I’ve put this together—thinking I’m “wrong” may be a stimulus to come up with what is right for you (that whole antagonism thing). Today’s Guiding Thought says, “I am in the flow and create and expand with Love, in Life.” For today, my choice in answer to this question is: I choose Creation/Life. The answer to this is whatever comes up, at any moment. What is serving you right now? For me: this pencil. This fire. This notebook. The sun. My breath. These thoughts. Most of the time, what serves you is very simple; in a sense, everything you experience serves you, every moment…just look around. How do I utilize what serves me? This is the “walking your talk” question. 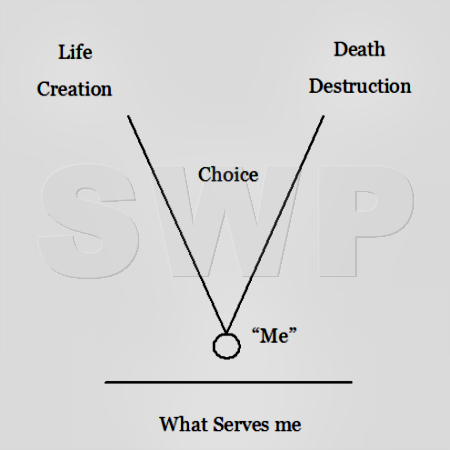 If I say in question #1 that I serve Life-Creation, then how I use what serves me must also serve Life-Creation. All of this then becomes the answer to the question, “How do I know.” Because if I use the things that serve me toward life and creation, I am being internally consistent; I experience Life and Creation with all of the Joy, Peace, and Harmony that comes with it (even in the midst of struggle or antagonism). If I say I serve Life, but then utilize things that serve me in a way that is directed toward destruction, I am internally inconsistent, and will experience conflict, dis-ease.What choices do you make? Where are you already consistent? Where can you become more consistent? For what ends (outcomes) are you most grateful—ones of creation, or ones of destruction? Can you make choices that will lead you to greater gratitude?